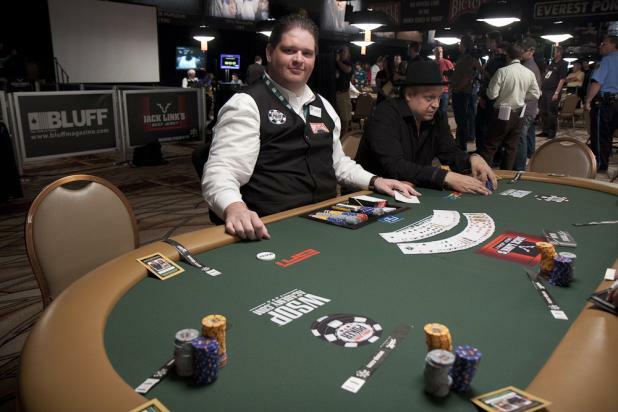 In the same hand as the previous photo, Greg Raymer (center) watches as Scott Seiver reraises Jennifer Harman on sixth street of seven card stud hi-lo. Harman shows 3h-Ac-6h-Kh to Seiver's 4d-Jd-9d-10c. Harman tanked for a while before forfeiting the pot to Seiver. Jennifer Harman (foreground) is the only woman who registered to play in Event #2 ($50,000 Player's Championship). Not only does this event feature the highest buyin, but it also switches between eight different variations of poker every eight hands. Neither of these factors bothers Harman, who regularly plays mixed games in the biggest cash games in the world. Here, she is playing a hand of seven card stud hi-lo against Scott Seiver (center-right), an online pro who has proved himself in live tournaments by winning more than $1 million in the past six months alone. 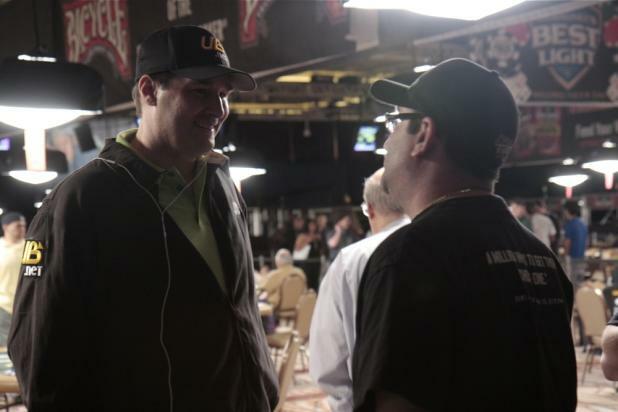 During a late break on Day 1 of Event #2 ($50,000 Player's Championship), Phil Hellmuth chats with Mike Matusow. 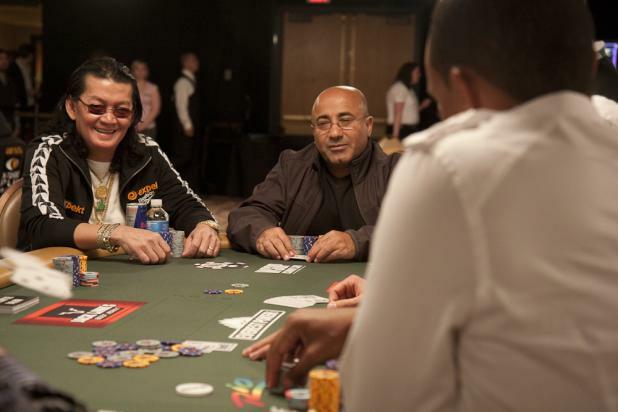 Both players survived to Day 2 of the five-day event with an average chip stack, though Matusow's count is unofficial -- he didn't report his official count at the end of the night. 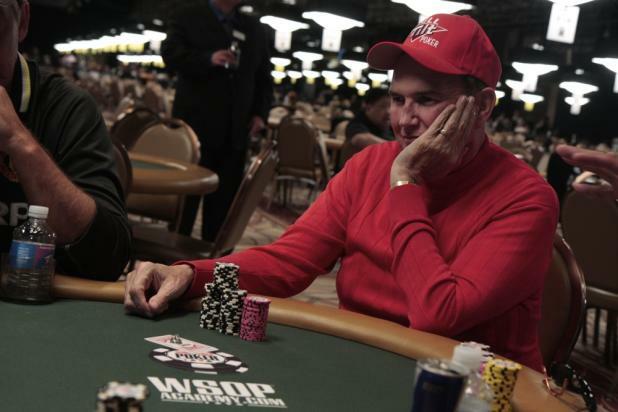 Jack McClelland is one of the most respected tournament directors in poker, and he ran the WSOP back in the 1990s before he moved over to Bellagio and turned it into the center of the high-stakes poker world. 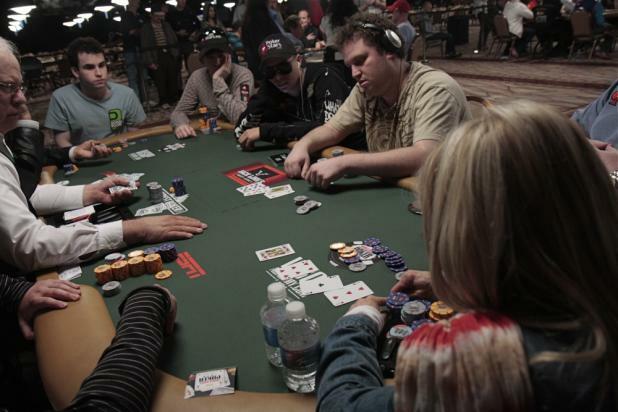 This photo was taken in the final minutes of the first day of Event #1 ($500 Casino Employees No-Limit Hold'em), and a few minutes later, McClelland was one of 53 survivors who will return tomorrow to battle for the first bracelet of the 2010 WSOP. Phil Ivey (foreground, right) shares a table in Event #2 ($50,000 Player's Championship) with 2008 $50,000 H.O.R.S.E champion Scotty Nguyen (left) and 2007 $50,000 H.O.R.S.E. champion Freddy Deeb. While Ivey has never won this event (yet), he finished third in 2006 behind runner-up Andy Bloch and the original champion, Chip Reese. At the start of Event #2 ($50,000 Player's Championship), tournament director Jack Effel (right) introduces the legendary Doyle Brunson (center) to offer some remembrances for his close friend and fellow poker legend, Chip Reese. Reese was universally considered one of the best all-around poker players in history, and won the first $50,000 event ever held at the WSOP, back in 2006. When Reese died unexpectedly the next year, the WSOP renamed the trophy in his honor -- the David "Chip" Reese Award. Jeffrey Lisandro has already taken his seat next to dealer Aaron Lashlee in Event #2, the $50,000 Player's Championship, while the media gathers behind him to wait for the tournament introduction from Jack Effel and Doyle Brunson. 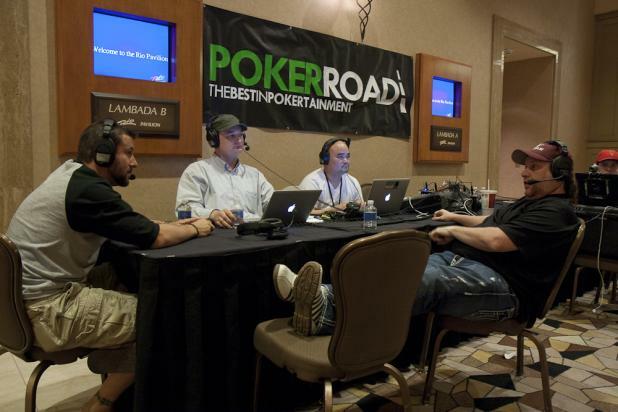 The hit poker radio show, Poker Road Radio, is broadcasting live from the World Series of Poker four days a week. Their first guest is 11-bracelet winner Phil Hellmuth, who, true to form, is late for his radio interview. From left to right: Joe Sebok, Jeremiah Smith, Jon Vuong, and Gavin Smith. Rachel Davis, a poker dealer here in Las Vegas, takes her seat among the 721 players in Event #1 ($500 Casino Employees No-Limit Hold'em). 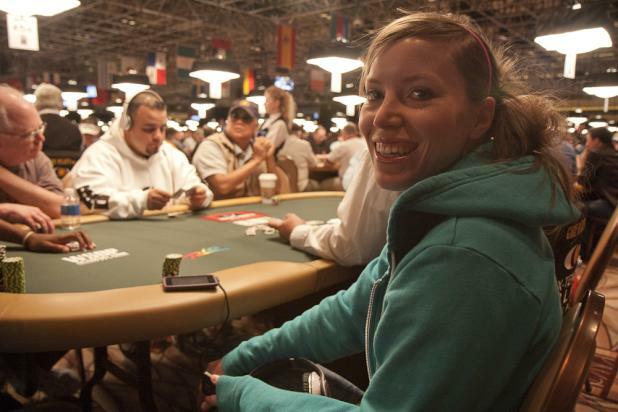 This is Davis's first WSOP event, though she comes from a strong lineage -- her father Michael Davis won a bracelet in last year's WSOP Seniors event. Event #1: Shuffle Up & Deal! 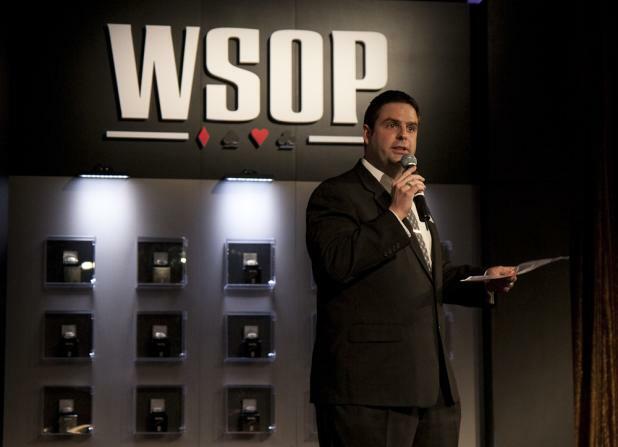 Jack Effel welcomes the players to Event #1 of the 2010 World Series of Poker. The first event of the WSOP is traditionally only open to casino employees, with an affordable buyin of $500. This year's event attracted 721 dealers, bartenders, servers, and a variety of other casino employees.